The members of Jam Bake Combo before a performance at the Peninsula Harvest Festival in October. 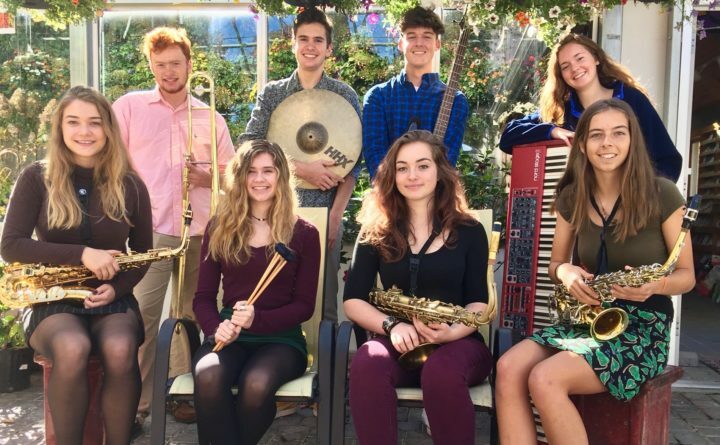 The GSA jazz combo will compete at the 50th Berklee High School Jazz Festival on Jan. 26. BLUE HILL — A George Stevens Academy jazz combo will compete at the Berklee High School Jazz Festival on Saturday, Jan. 26. Thousands of musicians from 131 schools across the country are expected to participate at the largest festival of its kind in the United States. Jam Bake Combo is composed of Courtney Bianco ’19, alto sax; Edward Conte ’19, drums; Erika Hipsky ’20, alto sax and flute; Duncan Howell ’20, trombone; Quinn Stabler ’20, bass; LeeAnn Varnum ’19, soprano and tenor sax; Elana Williamson, ’19 vibes and piano; and Tess Williamson ’19, piano and vocals. Combos from GSA have competed at the prestigious festival for many years. In 2017, the school took 2ndplace in its division, it’s best finish so far. That year, Yvonne Rogers and Joseph Boulet both received Outstanding Musicianship Awards, “a huge honor,” said Steve Orlofsky, “as only five awards are presented per division.” Orlofsky directs the jazz program at the George Stevens Academy. The school placed third or fourth in 2004, 2005, 2010 and 2011, and Ross Gallagher is the only other GSA student to earn an Outstanding Musicianship Award, in 2004. School officials hope that alums and other supporters of the music program will show their support by attending the festival and watching Jam Bake Combo compete at 11:45 a.m. The festival, held at the Hynes Convention Center in Boston, is open to the public, and no tickets are required to attend. Performances take place throughout the day. For more information, visit http://festival.berkleejazz.org.